This fall, I opened the classroom with a very simple (sort-of) multi-media project for my students. Last year, I piloted a number of different end-of-project reflection formats (long form, short form, written and typed) as well as online and offline versions. I lacked a reasonable and effective in-process journaling format. 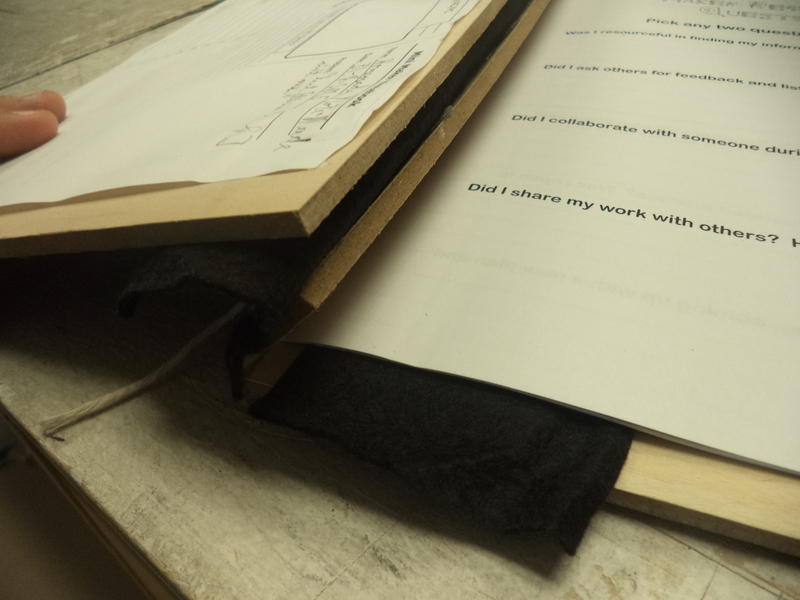 This year, I wanted to combine the paper lab report/maker journaling process with the final reflections. 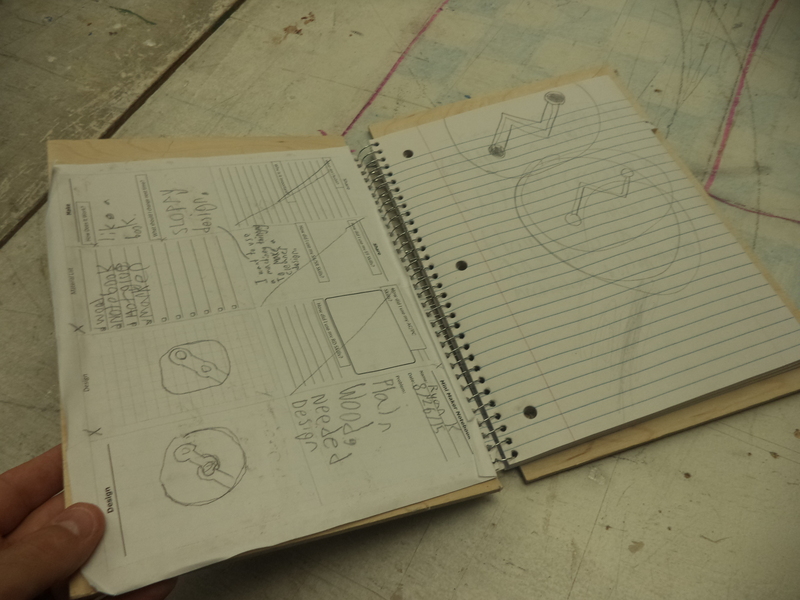 So my students and I made custom lab notebooks. Letter-sized paper with a combination of reflections, graph paper, etc. 2” wide strips of cloth, heavy felt, leather, etc. 1. Measure your paper. Cut two plywood rectangles an inch larger than you paper. So If you are using letter sized paper, cut two plywood rectangles 9 1/4” x 12”. Plywood cuts easily with a circular saw and saw guide, table saw or jig saw, depending on your level of comfort. Out of these large plywood squares, trim off a 1” strip. Save the trim. 2. Stack your paper up and punch holes into it. If you have access to a three hole punch, manipulate the paper so you have about nine holes. I used my school’s spiral book hole puncher, which was awesome and made tons of holes. 3. 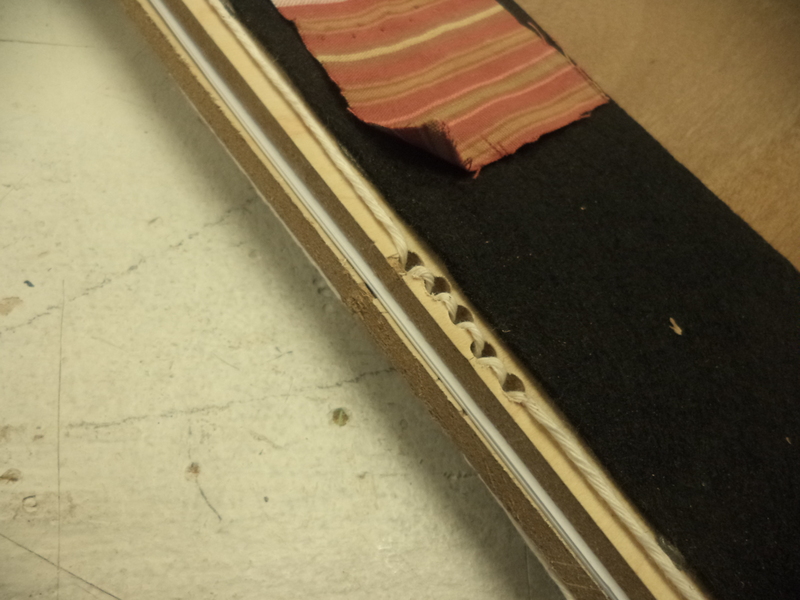 Lay one hole-punched sheet over the stripe of plywood, making sure to center the paper in your strip. Mark the centers of the holes with a pencil or awl. Once marked, tape two strips together, show sides on the out sides. Using a brad point bit and drill or drill press, drill out the marked holes. 4. Line up your large plywood sheets and strips. Hot glue the cloth strip to connect the two parts and create a hinge. 5. 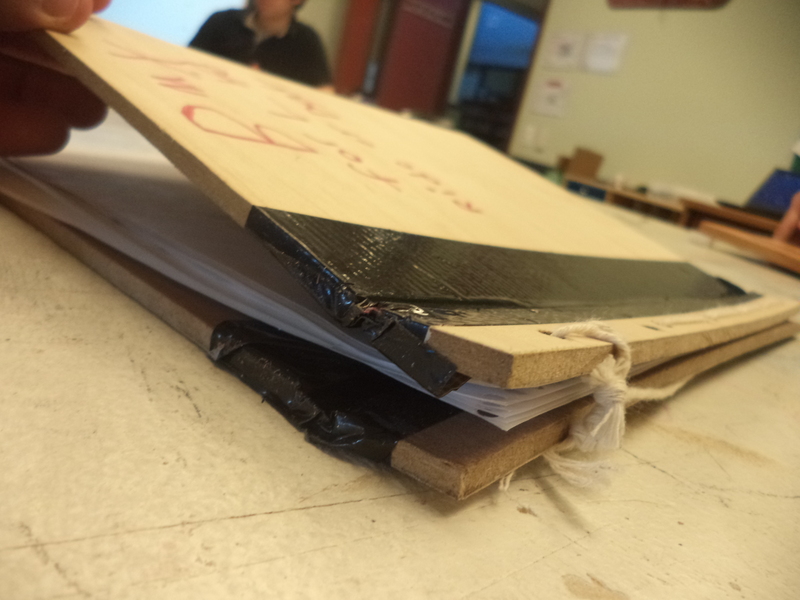 Now, make the spine sandwich – plywood strip, hole-punched paper, plywood strip. Line up the holes. Clamp the sandwich together with small clamps. 6. Bend a sewing needle from a paper clip. Use twine and sew up the spine. We used a modified running stitch to keep everything tight, but you can see the kids had all sorts of inventive ways of getting everything together. 7. Decorate any way you wish! My students drew pictures, used wood burner, made collages and even used the laser cutter for a few designs. Some reflections: Use quality plywood for best results. My last few posts (such as the Cajon Drums and Camera Obscura) have all featured high quality plywood scraps from a semi-local cabinet shop. For notebooks like this, the oak boards made for some great looking notebooks. Some students aren’t really ready to sew. 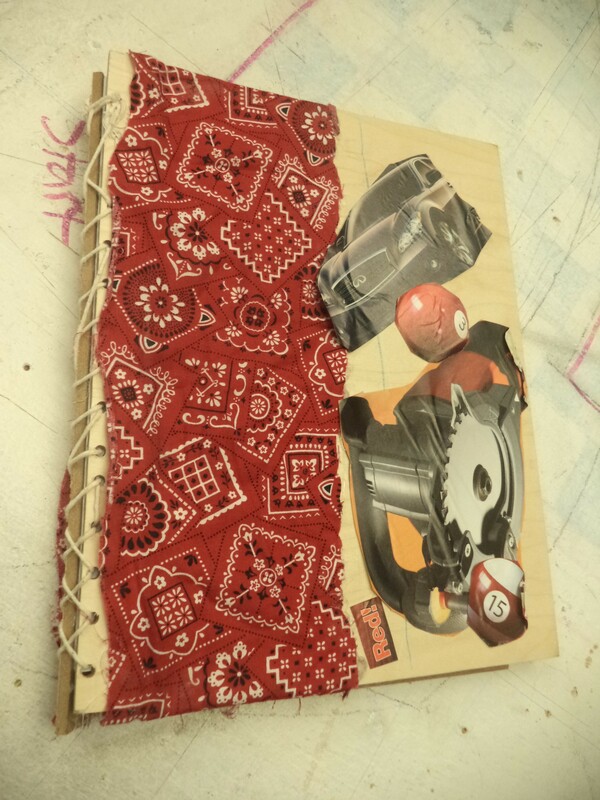 Instead, I had the students glue pre-cut covers onto commercially available notebooks. This worked out beautifully, as the students became experienced with hot glue and enjoyed the decorating. Thank you for visiting my practice zone and project showcase. If you wish to lend your support for this site, please like WoodshopCowboy on Facebook or follow me on Twitter. If you are interested in making and education, why not check out Work Notes, a curated set of articles from the web, published every week? Make it safe & keep the rubberside down. ← Community Watch: New Woodworking Class at TX/RX Labs!